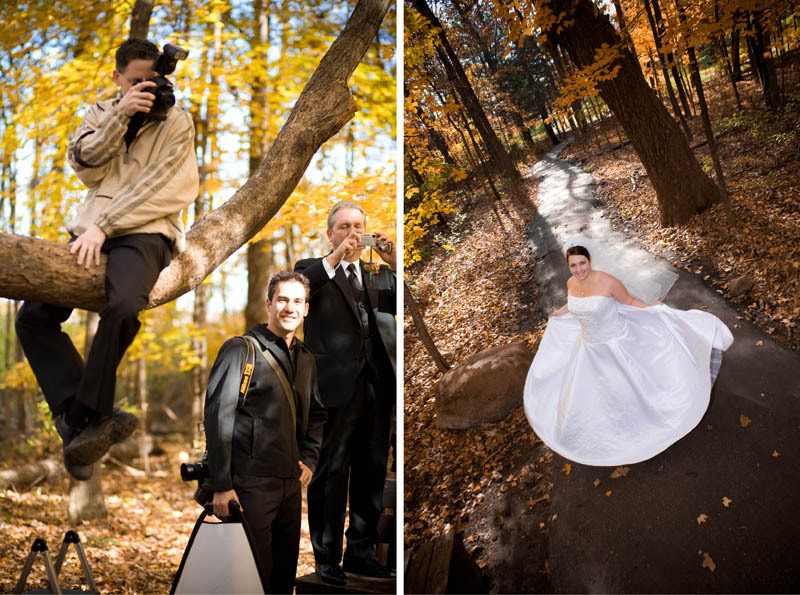 What is it like to work with Terpstra Photography during your event? You’ll feel at ease or even comfortable due to the occasional antics, jokes, or stunts meant to pull your whole group together for the best possible photography and to create natural expressions. It may mean you are getting ready at your Grandma’s house in the country and we get the idea to take your portraits by the soybean field next to a busy country road. If we want to capture the amazing sky we’ll have the assistants watch for traffic and we’ll get down and dirty for the shot! (actual photo by Ben Pancoast taken within seconds of Dan’s resulting photo on the left). It may mean that by your wedding day it’s a bit cold and the leaves have already fallen from the trees so the best angle is down. Never fear, we’ll have the assistants prop us up in a tree for the best shot and ensure we don’t fall out of the trees while we have you dance and spin around for some fun photos while your friends and family stand around and watch! (Photo of Dan shooting Ashley by Ben Pancoast). We may not be the fanciest part of your wedding day but the goal is to get the shots… capture the rings in the old building where you had your reception at the New Leaf in Chicago (left), capture the look on your face while your new husband dances around like a fool trying to embarrass you before the garter removal at Cascade Hills Country Club (right). It doesn’t matter what it takes, we’ll do it! And if it takes a different angle and your friends need a little pick-up, we’ll make our best attempt at the splits for a good laugh! We admit ahead of time that we’ll never be high school cheerleaders but sometimes making our best effort makes us look goofy enough for the best reaction out of you. There are so many “favorites” in life but the beach in Grand Haven on Lake Michigan, travel down south, and staying in hotels taking photos near the window are some of the best. No matter what, Dan Terpstra has the energy for whatever you need (and sometimes that means you don’t need any…) but the red shorts stay at home. Speaking of action and energy. Sometimes it takes some action to get that grumpy groomsman to run down the middle of a busy street when the bride and groom want to have this shot whereas other times it takes patient energy to withstand the cold and wind in off-season shoots! Pictured above is the cover and feature story shoot for the June 2008 edition of Lee Magazine which is a regional magazine promoting the Ft. Myer’s Florida area. The shoot was all about fly fishing but some of the shots required some pretty extreme angles and methods. Creating this shot may’ve destroyed my old Palm 650 but was great for Nikon representation! The long and short of our “what if” is that we’ve not blown it for any couple whether by weather, damaged gear, or health problems. It may not take the energy to jump so high, patience to wait for the perfect shot so long, agility to climb for the perfect perspective, or guts to leap into Lake Michigan but we’ve found it somehow gets people comfortable and wouldn’t you like to know what your photographer’s limits are; especially if they’ve not reached them yet? On July 28, 2007 there was no wedding planned due to the possible celebration of my 34th Birthday. I was called at the “last minute” about a wedding and informed them I wouldn’t be taking a wedding unless it was under extraordinary circumstances. In short, we had a GREAT day that produced many portolio shots seen on this site but while capturing the classic running shot I tripped and did my best not to fall but had taken the plunge. I grabbed two of the three cameras around my neck and tucked my head-in due to a childhood with more than enough concussions and breaks but hit the ground fast and hard. I had been running backward fast enough to make it hard for the bridal party to keep up which explains why the fall happened. In the end I had broken over $10,000 worth of gear that day. Gear that broke in two scenes included a 70-200 f2.8 lens, a 17-55 f2.8 lens, 2 SB-800 Flashes, a Nikon D2x body and a few little odds and ends not including a heavily bruised back/rib. We picked up the pieces, moved on to the next location and continued shooting with the back-up cameras we carry and shot one of our best weddings of 2007! No, this photographer doesn’t get stoned but in September 2009 I woke-up with a familiar but un-welcomed old friend — Kidney Stones! I knew I couldn’t shoot the three weddings that day while using Vicodin so the water started flowing fast. If you’ve ever had a kidney stone you know how quickly they can throw you to your knees in tears so I had to use my back-up plan! I shot a ceremony Saturday morning, a full wedding in the afternoon and evening, and a reception / party the following day with the only byproduct being great photos and more trips to the bathroom. I averaged 250oz per day over those three days and they never would’ve guessed there could’ve been a problem.